May. 4, 2013 7:00 a.m. Representatives from 23 different Legion branches across the Province gathered at the Devon Legion which had been chosen to host the 2013 spring conference on Saturday, April 27th. 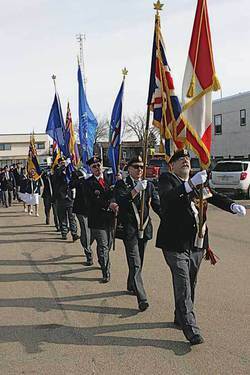 Devon residents were treated to a parade of uniforms and a colour guard marching through downtown, with a wreath laying ceremony at the cenotaph and Legion Chaplain Larry Froese briefly speaking and reminding everyone of the sacrifices made to keep this country free.